Ron Stallworth never perceived himself as having a “white voice,” but something about its candid inflection transcended the stereotype of black men speaking in the “jive” style of the early 70s. Spike Lee emphasizes this with unassuming assurance in the early scenes of “BlacKkKlansman,” showing us a man who is anchored by no particular sense of manner or distinction; he is simply an everyman seeking a place in the world, without much regard to whether he might be crippled or undermined by his ethnic background. Others are consciously aware of his presence, primarily, by the conditioning of their upbringing, but that’s of little surprise; he may be one of the only African Americans in a backwards Colorado town to ever walk into a police headquarters seeking a career in law enforcement. Some will come to regard him favorably after his capabilities are made known, while others will use their ignorance to blind them to his accomplishments. And though the film will tell the story of a man whose skill allowed him to successfully infiltrate the top ranks of the Ku Klux Klan, this is primarily about how injustice rebounds like an unpredictable pendulum, especially when it is controlled by men living in arrogance of their own privilege. If Stallworth’s experience resonated deeply only to the select few who knew of it when it was occurring, it comes to us now with wide, alarming accuracy. A year has passed since white supremacists marched in the streets of Charlottesville, inciting violence and causing death among bystanders, but its ramifications play like the awakening of a buried defense. Hate is ingrained deeply in the social structures of man – even moreso in countries like ours, which was founded on the destruction of another civilization – but time and progress has a way of concealing their nature, lulling us into a false security. The arrival of Trumpism has only aggravated the notion further, allowing the sources of these problems – particularly the Klan – to step beyond the shadows and find acceptance in new mainstream political movements. 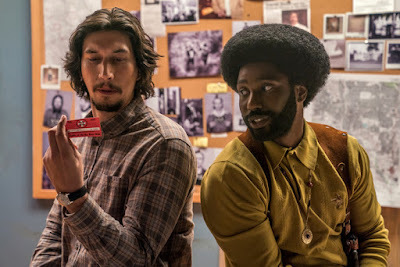 Lee’s creative force has often thrived as this reality is exposed, and his “BlacKkKlansman” may be the best film he has done in years: sharp and perceptive, unfiltered, confrontational, and driven by a deep dramatic current that sees reality without varnish or sanitation. We are a culture that was built on the bones of slaves, and to ignore that is to be complicit in a system destined to return us to primitive origins. Well before its conclusion, the movie hints at these possibilities through sharp dialogue and correlating situations. The hero is Ron (John David Washington), a new police officer aspiring for me than just a desk gig in the records basement, who one day audaciously answers a newspaper ad looking for new recruits in a local chapter of Klan members. His angle: manipulate the situation, from a distance, in order to earn the trust of the members and expose their identities, which has become key; racial tensions are beginning to spill over in his town as public speakers – some seen as radical – begin showing up to rouse the black population in striking down crimes committed against them, particularly by members of the police force. The first assignment requires him to go undercover to one such rally to measure the tensions of the African American community, although his superiors do not see the irony of that; their skepticism is deadened by Ron’s professional objectivity, even though placing him in the midst of a pollical shift that applies to him might rouse something more than just a need to gather information. While there, he meets Patrice Dumas (Laura Harrier), one of the primary activists, who is both dumbfounded and fascinated by Ron’s sense of neutrality. “Are you down for the liberation of black people?”, she pointedly asks. “Power to the people,” he responds, strategically keeping himself on a fence. He walks this tightrope, moreso than anything, because he hasn’t been able to bring himself to see the local police as a racist entity. Wouldn’t that undermine his cause, after all? How would others like her look at him, knowing that he freely ran with a professional crowd that seems likely to target innocent blacks on the streets and potentially subject them to cruel measures? Either way, his presence – and the obligatory kinship to Patrice – play like quiet nudges towards understanding the flip side of the argument, leading him to the assignment of calling the local chapter of the Klan to set up reading material and eventual participation. How the movie handles all these details without shoving them into a flash of nonsensical violence is refreshing. 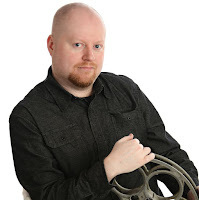 A less capable director would have taken the act of Ron’s masquerade, cloaked it in the guise of a thriller, and dropped all the key players into a climax with elaborate shootouts and bloodshed. But Lee is far more restrained than that. The key link is Flip, played by Adam Driver, who goes undercover to become “Ron” for the sake of appeasing the suspicious eyes of the local Klan members. While there, he is forced to recreate the image of a man eager to spread hate against Jews, blacks and Mexicans, despite quietly being Jewish himself. The function of this quandary, I suspect, is that Lee wants to show how the racial tensions are a universal force of decay. In doing so, Driver embodies a character that is strangely admirable: tempered to handle all the scrutiny of his racist peers while quietly detesting the very act of sharing their company without launching into showy diatribes or clenched fists. One of the film’s great scenes shows the duality of this idea: Flip is asked to go for shooting practice in a field where all the targets are made to resemble black men, and after they leave Ron comes into the field to regard them himself. Each man is silent but judging. And perhaps this is not an act: Lee actually used props that were once in the inventory of actual white supremacists, and they play like totems linking the retelling to its reality. The heart of the movie lies in its sobering sincerity – about people, their dual natures, their loathing, and how the absence of understanding will replay this cycle of racial divides well into the coming centuries. Their only hope, perhaps, is a voice wise enough to quell the tension. For Lee, in a present day dominated by the new normalization of racism, Ron is the refreshing equalizer. Here is a man of a conviction deeper than knee-jerk incentives or outlandish hyperbole; always focused and contemplative, he creates an elaborate trap that is almost brilliant in how it holds up a cultural mirror against people far too cynical to comprehend any sense of diversity. Sometimes that can be rooted to inexperience, other times hate, and greater still outright laziness. Consider a series of wonderful scenes where Ron banters on the phone with David Duke (Topher Grace), who attempts to sound insightful about the white hierarchy without being driven by anything beyond lurid soundbites. Does he share these views because he genuinely believes them, or is he selling the points to someone he suspects won’t grasp their shallow nature? If the approach is compelling, even beyond its relevance, it’s because Lee is not simply rehashing the undercurrents of his long career. His earlier films – especially “Do the Right Thing” and “Malcolm X” – were far more urgent and aggressive because they had to be; few had dealt with the difficult questions before him, and bringing them up was like taking a sledgehammer to a cultural delusion. Now the mask of intolerance has crumbled as both sides have taken to the streets, leaving little doubt that the strains remain alive and thriving. The agenda of “BlacKkKlansman,” in that respect, is to observe from a far less sensational standpoint. The movie is more contemplative than confrontational. But through its dedicated actors, a perceptive screenplay and a brazen sense of directorial focus, the movie comes alive as an understated call to arms, where intelligence and character become the great tools to conquer a primitive American philosophy.